The CKLS process (introduced by Chan, Karolyi, Longstaff, and Sanders) is a typical example of a mean-reverting process. It combines random fluctuations with an elastic attraction force that tends to restore the process to a central value. As such, it is widely used to model the stochastic behaviour of various financial assets. However, the calibration of CKLS processes can be problematic, resulting in high levels of uncertainty on the parameter estimates. 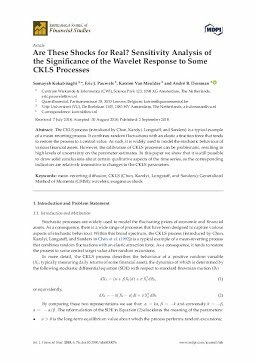 In this paper we show that it is still possible to draw solid conclusions about certain qualitative aspects of the time series, as the corresponding indicators are relatively insensitive to changes in the CKLS parameters.